With a little care and safety in mind, replacing the Halogen Lamp isn’t such a huge task and very inexpensive, but does require patience. Most Halogen cookers are very similar in construction, disassemble with care noting where all the screws go. If you have never attempted it before, a digital camera is a useful aid, take a picture at each stage, reversing the procedure to re assemble. Note especially if there are many screws of different length, a felt pen is useful to mark for example where the long screws go. ALWAYS FULLY DISCONNECT FROM THE MAINS ELECTRICITY SUPPLY BEFORE DISASSEMBLING ANY PARTS! Many Thanks, I was just about to throw our Halogen Oven out, so glad I didn’t, it only took my about 30 minutes to replace the lamp. Now its back to perfect working order and is used every day. 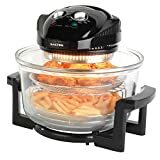 I have a charles jacobs halogen oven and the bulb has gone, i love this oven but can’t work out how to get the bulb out in the first place to replace it, can anyone send me instructions please? Electrically its just the same as any AC bulb, either way round it will work.